Bioceramics are ceramic materials primarily used for the repair, reconstruction and replacement of diseased or damaged parts of the musculo-skeletal system. The use of these materials has led to remarkable advances in the quality of life for millions of people. 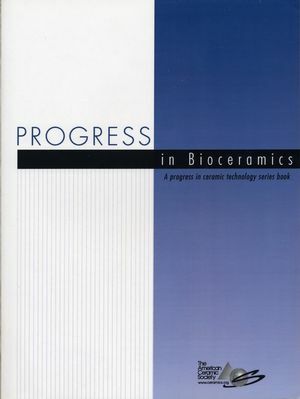 In the future, bioceramics will continue to be improved upon and new materials and applications will be discovered. Novel Method to Manufacture Porous Hydroxyapatite by Dual-Phase Mixing (S.H. Li, J.R. de Wijn, P. Layrolle, K. de Groot). Slow-Crack-Growth Behavior of Zirconia-Toughened Alumina Ceramics Processed by Different Methods (A.H. De Aza, J. Chevalier, G. Fantozzi, M. Schehl, R. Torrecillas). Composition and Crystallization of Hydroxyapatite Coating Layer Formed by Electron Beam Deposition (D.-H. Kim, Y.-M. Kong, S.-H. Lee, I.-S. Lee, H.-E. Kim, S.-J. Heo, J.-Y. Koak). Synthesis of Nanosized and Microporous Precipitated Hydroxyapatite in Synthetic Polymers and Biopolymers (A. Sinha, S. Nayar, A. Agrawal, D. Bhattacharyya, P. Ramachandrarao). Sintered Hydroxyapatite Latticework for Bone Substitute (F.C. Gomes de Sousa, J.R.G. Evans). Bioactivity and Mechanical Properties of Poly(Dimethylsiloxane)-Modified Calcia-Silica Hybrids with Added Titania (Q. Chen, N. Miyata, T. Kokubo, T. Nakamura). Joining of Calcium Phosphate Invert Glass-Ceramics on a Beta-Type Titanium Alloy (T. Kasuga, M. Nogami, M. Niinomi). Synthesis of Hydroxyapatite Nanopowders via Sucrose-Templated Sol-Gel Method (S. Bose, S.K. Saha). From CT Scan to Ceramic Bone Graft (J. Darsell, S. Bose, H.L. Hosick, A. Bandyopadhyay). Preparation of Polymethylmethacrylate-Reinforced Functionally Graded Hydroxyapatite Composites (M. Ohgaki, K. Yamashita). Dispersing Behavior of Hydroxyapatite Powders Produced by Wet-Chemical Synthesis (M. Pretto, A.L. Costa, E. Landi, A. Tampieri, C. Galassi). Improving the Durability of a Biomedical-Grade Zirconia Ceramic by the Addition of Silica (L. Gremillard, J. Chevalier, T. Epicier, G. Fantozzi). Transparent Hydroxyapatite Ceramics Through Gelcasting and Low-Temperature Sintering (H. Varma, S.P. Vijayan, S.S. Babu). Biomimetic Hydroxyapatite Coating on Metal Implants (P. Habibovic, F. Barrere, C.A. van Blitterswijk, K. de Groot, P. Layrolle). Effects of Yttria-Stabilized Zirconia on Plasma-Sprayed Hydroxyapatite/Yttria-Stabilized Zirconia Composite Coatings (L. Fu, K.A. Khor, J.P. Lim). Preparation of a Bioactive Poly(Methyl Methacrylate)/Silica Nanocomposite (S.-H. Rhee, J.-Y. Choi). Reaction Sintering and Mechanical Properties of Hydroxyapatite-Zirconia Composites with Calcium Fluoride Additions (H.-W. Kim, Y.-H. Koh, B.-H. Yoon, H.-E. Kim). Formation and Properties of Hydroxyapatite-Calcium Poly(Vinyl Phosphonate) Composites (Y.E. Greish, P.W. Brown). Fabrication of Macrochannelled-Hydroxyapatite Bioceramic by a Coextrusion Process (Y.-H. Koh, H.-W. Kim, H.-E. Kim, J.W. Halloran). Effect of Silicon Substitution on the Sintering and Microstructure of Hydroxyapatite (I.R. Gibson, S.M. Best, W. Bonfield). Wear Simulation of Alumina-on-Alumina Prosthetic Hip Joint Using a Multidirectional Motion Pin-on-Disc Device (V. Saikko, J. Keranen). Calcium Phosphate Bioceramics with Various Porosities and Dissolution Rates (S.-H. Kwon, Y.-K. Jun, S.-H. Hong, I.-S. Lee, H.-E. Kim, Y.Y. Won). Molten Salt Synthesis of Calcium Hydroxyapatite Whiskers (A.C. Tas). Gel-to-Ceramic Conversion During Hydroxyapatite Synthesis (M.-F. Hsieh, T.-S. Chin, L.-H. Perng, H.-G. Perng). Hydroxyapatite Coating on Termally Oxidized Titanium Substates (M. Vatanatham, S. Kimura). Nanophase Ceramics as Improved Bone Tissue Engineering Materials (T.J. Webster). 3-D CT Images for Biomimetic Artificial Bone Design and Manufacture (J. Tain, X. Wang, C. Zhang, Z. Guo). No Bones About It-Rapid Prototyping-The Future for Bioceramic Implants (A. Emory). The Role of Ceramics in an Age of Biology (L.L. Hench). A Review of Bone Substitutes in Bone Remodeling: Influence of Materials Chemistry and Porosity (A.C. Tas). Manufacturing of Thermally Sprayed Tricalcium Phosphate Coatings for Biomedical Applications (M. Baccalaro, R. Gadow, K. von Niessen). Electrochemical Deposition and Patterning of Calcium Phosphate Bioceramic Coating (K. Duan, Y. Fan, R. Wang). Two and Ten Year Retrievals of Zirconia Femoral Heads: XRD, SEM and Raman Spectroscopy Studies (D.D. Green, G. Pezzotti, S. Sakakura, M. Ries, I.C. Clarke). CERAMIC ENGINEERING AND SCIENCE PROCEEDINGS (CESP). 3 Dimensional CT Analyses of Bone Formation in Porous Ceramic Biomaterials (M. Mizuno, M. Mukaida, Y. Ikeda, M. Yasutoshi, T. Nakamura, M. Neo). Wear Characterization of Clinically used Hip Joint Prostheses by a HIP Simulator (Y. Takigawa, K. Jono, H. Takadama, M. Mizuno, T. Nakamura). Fabrication of Biocompatible Calcium Phosphate Ceramics Using Eggshell (S.J. Lee, W.M. Kriven). Calcium Aluminate/Calcium Phosphate Composite Orthopedic Cement (M.L. Roemhildt, T.D. McGee, S.D. Wagner). Fabrication of Composite for Bone Repairing from Alpha-tricalcium Phosphate and Hydroxypropylcellulose (T. Miyazaki, C. Ohtsuki, H. Iwasaki, S. Ogata, M. Tanihara). Preparation of Bioactive Inorganic-Organic Hybrids by Hot Water Treatment (M. Kawashita, M. Kamitakahara, N. Miyata, T. Kokubo, T. Nakamura). Apatite Formation on the PMMA Bone Cement Modified with Alkoxysilane and Calcium Salt in a Simulated Body Fluid (C. Ohtsuki, T. Miyazaki, A. Sugino, M. Tanihara, A. Mori, K. Kuramoto). Formation of Hydroxyapatite Coatings on Alumina under Hydrothermal Conditions (J.-S. Ha, M.N. Rahaman). A Multi-Station Hip Joint Simulator Study and Wear Characterization of Commercial Hip Endoprostheses (K. Jono, Y. Takigawa, H. Takadama, M. Mizuno, T. Nakamura). Processing of Bioactive Ceramics with Defined Porosity (C.M. Lofton, H. Huang, W. Sigmund). Bioactive Surface Functionalization: Concept and Applications (H.-M. Kim). Affects of Alumina and Titania Nanoparticulates on Bone Cell Function (L.G. Gutwein, T.J. Webster). A Composites Approach to Tissue Engineering (A.R. Boccaccini, J.A. Roether, L.L. Hench, V. Maquet, R. Jerome). Increased Osteoblast Function on Nanofibered Alumina (T.J. Webster, L.G. Gutwein, F. Tepper). Bioactive Glass-Ceramic Materials for Bone Substitutes (C.V. Brovarone, F. Smeacetto, E. Verne). Fatigue Property of Zirconia for Hip Joint Prostheses (Y. Takigawa, Y. Yasutomi, M. Mizuno, K. Shirakihara).